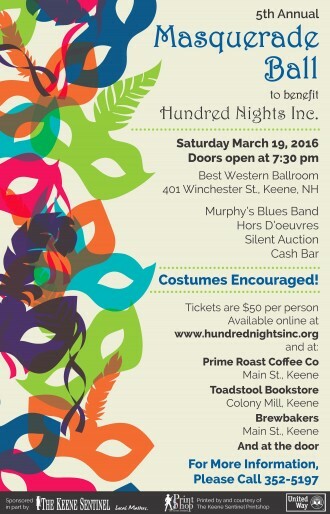 Hundred Nights, Inc. is pleased to announce that the 5th Annual Masquerade Ball is taking place on March 19, 2016! If you have never been, the Ball is a fabulous event that features local band Murphy’s Blues. Put on your dancing shoes and join in the fun! The event will be held this year at the Best Western Sovereign Hotel, located at 401 Winchester St. in Keene. Doors open at 7:30 pm. An array of delectable hors d’oeuvres, savory and sweet, will be provided and a cash bar will be available. Masks and costumes are encouraged, but not required, although there is a prize for Best Costume! Tickets are $50 per person, and are available in several different ways. One option is by going to the Hundred Nights website (www.hundrednightsinc.org) and using the donation button – make a note on the donation form that says “tickets”, and we will either mail them to you or hold them at the door. You may purchase tickets ahead of time at Prime Roast Coffee on Main St., Toadstool Bookstore at the Colony Mill, or Brewbaker’s Café on Main St., all in Keene. Or you may purchase your tickets at the door!